Smart Fan Featuring D-Link Green 3.0 technology, the DGS-1510 series offers a high level of energy saving and efficiency, as it also complies with the IEEE 802.3az Energy Efficient Ethernet standard. Support for IPv6 management and configurations ensures your network remains protected after the upgrade from IPv4 to IPv6. By offering multiple management options, the DGS-1510 Series allows quick deployment, infrastructure expansion, and seamless function upgrades. Built for small and medium-sized businesses, the DGS-1510 Series provide functionality, security, and manageability for a fraction of the standard cost of ownership. 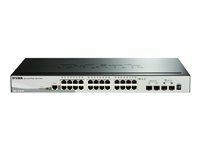 The DGS-1510-28P s the next generation of SmartPro switch. 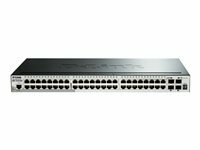 It contains 24 10/100/1000 Mbps PoE plus 2 Gigabit SFP ports and 2x 10G ports. With its 10G SFP+ ports, the DGS-1510-28P is ideal for deployments in the SME/SMB core with its 10G uplinks connecting with servers equipped with 10G port connectivity. For medium to large scale enterprise deployment, it can serve as a good interconnection between the core switch and edge switch. The DGS-1510-28P's 10/100/1000 Mbps ports are PoE-enabled for powering devices such as IP cameras, VoIP phones and wireless access points. Compliant with 802.3af and 802.3at, the DGS-1510-28P supports up to 30W of power output on any particular PoE port up to 193W, providing flexibility in power allocation for a variety of powered devices, including new 802.11ac wireless access points that require 802.3at power for full functionality. Time based PoE enables power to a port to be shut off at a scheduled time, reducing power usage and increasing security by powering off devices that should not be in use during non-business hours. 2 x Smart fans Featuring D-Link Green 3.0 technology, the DGS-1510 series offers a high level of energy saving and efficiency, as it also complies with the IEEE 802.3az Energy Efficient Ethernet standard. Support for IPv6 management and configurations ensures your network remains protected after the upgrade from IPv4 to IPv6. By offering multiple management options, the DGS-1510 Series allows quick deployment, infrastructure expansion, and seamless function upgrades. Built for small and medium-sized businesses, the DGS-1510 Series provide functionality, security, and manageability for a fraction of the standard cost of ownership. 10G SFP+ stacking/uplink ports The two SFP+ ports of the DGS-1510 Series switches allow users to create a physical stack of up to 6 units in a fault-tolerant ring or linear topology using Direct Attach Cables (DACs) or any compatible SFP+ transceiver. This creates a total of 288 Gigabit ports, ensuring high bandwidth while staying cost-efficient. Meanwhile, the remaining uplink ports can be used for other functions, such as connecting to a larger network. 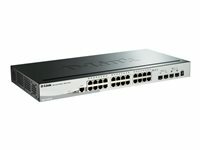 Users can also easily configure and manage any of the DGS-1510 Series Smart Managed switches in a single stack. With 20 Gbps full-duplex capabilities, the DGS-1510 Series offers 10G connectivity to core networks and servers while still maintaining fast data transfer rates. 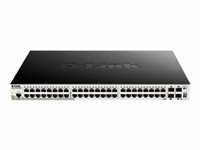 Layer 3 traffic management The DGS-1510 Series provides static routing, allowing you to segment your network into workgroups that communicate between VLANs and increase application performance. With these capabilities, you can reduce the load on your core devices, allowing you to create a scalable and efficient network. 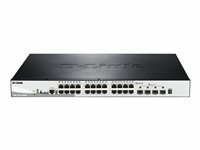 Extensive Layer 2 features The DGS-1510 Series switches are equipped with a complete line-up of Layer 2 features, including IGMP Snooping, Port Mirroring, Spanning Tree, and Link Layer Discovery Protocol (LLDP). The IEEE 802.3x Flow Control function allows servers to directly connect to the switch for fast, reliable data transfer. Network maintenance features include Loopback Detection and Cable Diagnostics. Loopback Detection automatically detects and shuts down loops created by a specific port or VLAN. The Cable Diagnostics feature, designed primarily for administrators and customer service representatives, can determine cable quality and can quickly discover sections of cabling that need to be replaced. Traffic classification & QoS The DGS-1510 Series supports Auto Surveillance VLAN (ASV) and Auto Voice VLAN, which are suited for VoIP and video surveillance deployments. Auto Surveillance VLAN is an advanced technology built into D-Link Smart switches. This technology consolidates data and surveillance video transmissions through a single DGS-1510 Series Smart Managed switch, saving businesses the costs of maintaining expensive dedicated hardware and infrastructure. ASV also ensures the quality of real-time video for monitoring and control without compromising the transmission of conventional network data by giving ASV traffic priority over other packets. Keep your network secure D-Link's innovative Safeguard Engine protects the DGS-1510 Series against traffic flooding caused by malicious attacks. The DGS-1510 Series supports both MAC and web-based access control. This gives network administrators multiple authentication options, reducing deployment times and removing the need for client software. The DGS-1510 Series supports IEEE 802.1X port-based authentication, allowing network users to be authenticated through external RADIUS servers. The Address Resolution Protocol (ARP) Spoofing Prevention feature helps to prevent attacks that may allow an intruder to intercept users' traffic while the DHCP Server Screening feature screens rogue DHCP server packets from user ports to prevent unauthorized IP assignment. IPv6 ready The DGS-1510 Series is IPv6 ready and supports various IPv6 functions such as MLD Snooping, IPv6 security features, and IPv6 Quality of Service (QoS), ensuring seamless integration with next generation networks. The DGS-1510 Series also supports IPv4/v6 dual stack functionality, which allows the switches to act as a bridge between IPv4 and IPv6 networks.